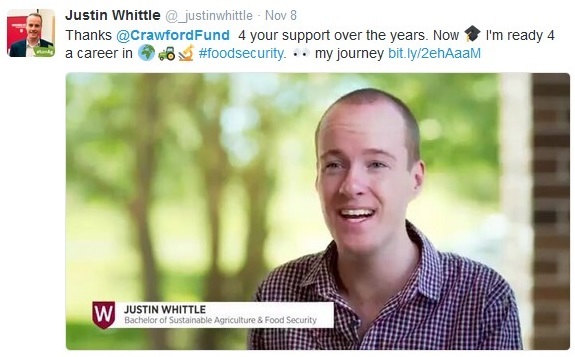 We recently had a lovely tweet from former conference scholar Justin Whittle, who was a scholar in 2015 as part of the group attending from the Global Youth In Agriculture Summit. Justin went on to study in Thailand under the New Colombo Plan. Inspired by his 2016 visit to Thailand as a New Colombo Plan Scholar, Justin created a video that explains his journey and passion for a career in agriculture for development. In this video, “School of Science & Health: Making the most of it”, he discusses the impact of his international journey and other student experiences he has participated in during his university education. We are so proud that we played some role in encouraging Justin in his passion for agriculture and nutrition.